Candidates are required to give their answers in their own words as far as practicable. The figures in the margin indicate full marks. 1. How can you say that 'Language is an arbitrary, voluntary, vocal system of human communication'? Explain all the key terms of this definition. 2. Is it necessary to study linguistics for a would-be language teacher? 3. Is there existence of animal language in the technical sense of 'language'? Why or why not? Explain. The word guru in Nepali was originally used to refer to 'spiritual teacher' but, nowadays, it is used to refer to all kinds of teacher and even a driver. What is the technical term in linguistics for such a change? Explain the term with other examples. 4. Between speech and writing which one do you think came into existence first? Justify with minimum four examples. 5. Define phonetics and phonology in your own words, and mention any three key differences between them. 6. Both 'antonym' and 'antonymy' come under the same word class, namely noun but, they mean different things/concepts. Explain with examples. Pragmatics is defined as 'the study of speaker meaning'. What do you mean by 'speaker' meaning? How does it differ from literal meaning of a linguistic term? 7. How are the words edit and telecast formed? Explain the processes involved in the formation of these words with one each other with examples. What are the criteria to describe vowel sounds? Describe the sounds | ə |, | u | and | i | using those criteria. 9. What do you mean by co-operative principle? What maxims of conversation does it include? Explain them with examples. 10. What are the core stages of error analysis? Discuss them with examples. How many consonants are there in the sound system of English? List them all in terms of phonemic symbols with at least two example words of each. 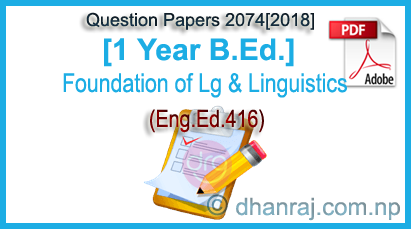 0 Response to "Foundation of Lg & Linguistics (Eng.Ed.416) | Question Paper | 2074 | Bachelor Level | One Year | Education | TU"